The Shuster Group launched the leasing program for its new 12-story Art House luxury rental building in downtown Jersey City’s historic Powerhouse Arts District this summer and the building is nearly fully-leased and occupied. 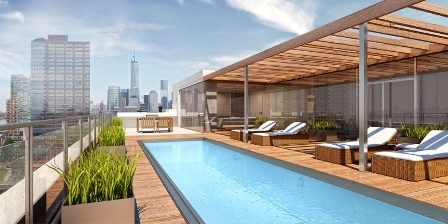 Designed by Fogarty Finger Architects and LWDMR & Associates, the boutique 12-story building offers 119 luxury apartments and exceptional indoor and outdoor amenities, including a rooftop pool and sun deck offering spectacular views of the Manhattan skyline. The opening of the building coincided with the announcement of The Art Project, a collaboration of The Shuster Group, the Jersey City Economic Development Corporation and the City of Jersey City to promote local artists by displaying their creations in the Leasing Office/Art Gallery and selling the works of art to help inspire underserved youths through advanced visual arts courses.